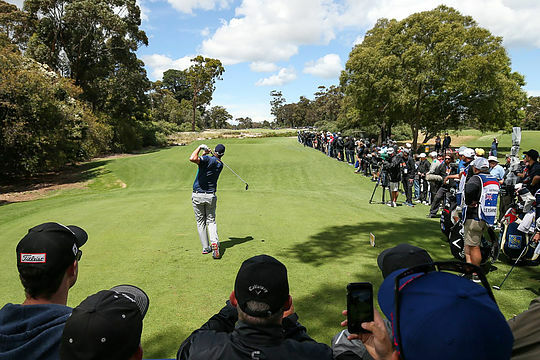 A 3-metre birdie at the final hole this afternoon secured a share of the lead for the Aussie duo of Cameron Smith and Marc Leishman in round one of the World Cup Of Golf at Metropolitan Golf Club in Melbourne. The pair carded eight birdies and an eagle at the par 5, 4th hole in a 10-under round of 62 to sit alongside England (Poulter/Hatton) and South Korea (An/Kim). “I think it was very important for us to get off to a good start. You don’t want to be fighting back the whole tournament,” said Leishman, who contributed four birdies while Smith made an eagle and four birdies. “I think we just combined really well. Like Leish was saying, once one of us was in a bit of trouble, the other one just hit the centre of the green, gave ourselves 20, 30 feet and an opportunity at birdie,” added Smith. Defending champions Denmark (Olesen/Kjeldsen) are one shot back from the lead in equal 4th place with Belgium (Pieters/Detry) and Malaysia (Green/Leong). Team USA’s Matt Kuchar and Kyle Stanley struggled as the events of the last few weeks caught up with Matt Kuchar and they fell away to close the day in a share of 13th place at 6-under. Last week’s Australian Open hero, Abraham Ancer, along with teammate Robert Diaz closed in 20th place alongside Scotland and Thailand. Tomorrow and Sunday will be played in foursomes (alternate shot) with fourballs again on Saturday.